Nanode is an Arduino like 8 bit microcontroller board with integrated Ethernet connectivity. It has 6 analogue sensing channels and 6 spare digital I/O lines. It can be used for a variety of web connected applications including remote control and monitoring, as a smart sensor, home automation, as a Tweeting device, and for publishing small amounts of data to the web. The existing software allows it to be set up as an I/O webserver - a device which sends the state of its analogue and digital I/O to a web page - and which can be controlled from that webpage. However it is not restricted to just that role, it can act as a publisher device and send data to an intermediary open data service such as Pachube, and it can act as a web connected I/O device, which subscribes to a Pachube data feed and acts according to the data received from that feed - for example setting its I/O, updating a display or controlling some actuator device. By using Pachube's API as a smart intermediary, much of the burden of serving an interractive webpage is eliminated from the Nanode. A final application, uses an interpreted language called Bitlash which allows scripts to be written and stored in EEprom on the microcontroller or on an external SD card. We are developing a Telnet aopplication which would allow a Nanode running bitlash to be remotely reconfigured to run a different script. Nanode has a lot in common with the Tuxgraphics Web Server - in fact the Tuxgraphics TCP/IP stack was ported to Arduino, and thence onto Nanode. Here's an article with a lot of the background information to how the stack works and how it serves small web pages efficiently. You now have a flashing red LED which shows that the bootloader and Blinky program is running on the microcontroller , and are keen to connect to the internet. If you are unfamiliar with Arduino, you might wish to visit the extensive reference and examples pages linked to the main Arduino Homepage site. Nanode is essentially just an Arduino with ethernet connectivity added - so anything that you can do on Arduino, you should be able to do with Nanode. The easiest way for newcomers to access Nanode is to use the Integrated Design Environment (IDE) provided with Arduino. However, more experienced C coders may wish to use the open source GCC C compiler directly with AVRdude or the toolset provided by Atmel in AVR Studio. In short - there are several ways to skin the cat called Nanode. Note there are some slight differences, the LED on Nanode is on Digital 6 rather than Digital 13 on Arduino and it lights when digital 6 is set LOW - so its sense is inverted - more on why this is later. Nanode uses an ethernet library which was written specifically to drive the ENC28J60 ethernet controller. This device is used on several similar designs, and it must be noted that the library needs to be tailored so that it correctly addresses the ENC28J60 via digital pin 8, and not pin 10 as used in some ENC28J60 based ethernet shields. Pin 8 is the pin used by the microcontroller to select the ENC28J60 for the SPI bus and if you don't add this, the MCU won't be able to communicate with the ENC28J60. This will appear as ENC28J60 Version 7 after the change has been made and you will know that all is well. We are in the process of creating a Nanode specific library that defaults to pin 8, so this change will not be needed in the future. Nanode owners who have bought Nanodes through the London Hackspace may contact Pachube to receive a free Pro Account. Pachube have been very supportive of the Nanode Project with this generous gesture to get a lot more Nanodes using Pachube and developing interesting applications. Contact Ed Borden at the email address below to collect your free Pro user account. From Ed Borden, Pachube, New York. "We are really excited about this project here at Pachube. We want to give our full support to anyone who has the gumption to take this thing and pull it along to the next level. I don't care if you haven't tested the first run yet! :) Full steam ahead! For any of you guys on this list who bought a Nanode from Ken and want to connect it up to Pachube, drop me a line with your username and I'll upgrade your account to Pro. And when you do something awesome that you want the world to know about, tell us about it!" The ATmega328 microcontroller supplied with the kit has a specially modified version of the Arduino bootloader pre-programmed into it, together with an initial program to flash the red LED. Arduino usually has a LED wired to digital pin 13, but in Nanode, digital 13 is in almost constant use as the SPI Clock so in the Nanode bootloader the LED flashing function has been altered so that it flashes the red LED which is wired to digital pin 6. If all is well with your Nanode board the red LED should start flashing about 2 seconds after the power (from USB or FTDI cable) has been applied. If it does not flash, check for faults such as missing soldered joints or the LED incorrectly inserted. Read this and the following EtherShield Examples sections to familiarise yourself with the basic operations of the Arduino IDE: programming, compiling and uploading code to the Nanode. Note that EtherShield is spelt with a capital E and a capital S. You may get compilation problems if you deviate from this spelling. The first couple of examples will help you confirm that your hardware is fully functional and that you can get a DHCP address and serve a simple webpage from your Nanode. In the Arduino application menu Tools/Board select "Arduino Duemilanove or Nano w/ ATmega328"
3a. NOTE: The US-based version from Wicked Device tends to come with a cable that uses a chip from Silicon Labs instead of FTDI. Drivers for OSX or Windows (Linux doesn't need them) can be downloaded directly from Silicon Labs. Here's a nice writeup that explains it all. Plug in the FTDI programming cable. In the Arduino application menu Tools/Serial Port select the appropriate device, e.g., "/dev/tty.usbserial-A400f2he" on a Mac or "/dev/ttyUSB0" on Linux. Mac users: make a folder called "libraries" in Documents\Arduino\ then place the EtherShield folder into the newly created libraries folder. This is required because the correct name of the file is "WProgram.h" (in arduino-0022/hardware/arduino/cores/arduino/). There's no need to keep or correct this line as the file has already been included by NanodeMAC.h (which has already been corrected for case in the git repository). Place in the Arduino libraries folder as for EtherShield, above. Be sure to set the baud rate at 19200. 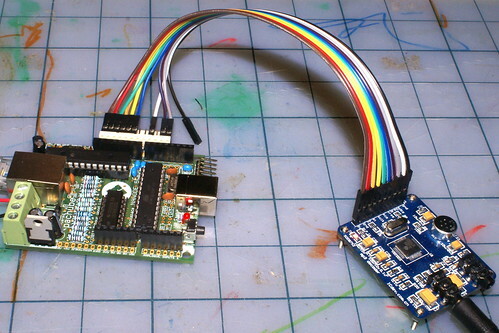 Once you have built your Nanode and got the red flashing LED which shows that all is well with the ATmega328 microcontroller and its bootloader program, it is now time to test the rest of the system, which includes the ENC28J60 ethernet controller and its interface through the magjack connector to the ethernet port. Conveniently, Andrew Lindsay, has provided some simple example to accompany his EtherShield Library. It is common practice amongst Arduino libraries to provide accompanying tried and tested code examples, which are loaded as part of the library folder. Make sure you have Arduino 0021 or better still 0022 installed, and press the download button. This will download the library as a .tar or .zip format into a temporary folder. Unzip the contents of this zip and put it in a folder named "EtherShield" within the Arduino/libraries folder. (Remove any previous version of EtherShield library - as this causes code compilation problems). When you restart the Arduino IDE, it will find this new library and add it into the Examples on the Files menu. Press the save button from the tool bar - a downward pointing arrow to save this change for later. Now make sure that you have the correct serial port connected from Tools/Serial Port and that the Board type has been selected as Arduino Duemilanove or Nano w/ATmega 328 - the second option down the list. Wait for the IDE to respond with Done Uplading. The Arduino code normally starts up about 2 seconds after the end of the download. This opens up a serial terminal window so that we can look at the debug output from the program. If you get ENC28J60 version 0 - this means that the ATmega has failed to make contact with the ENC28J60 - and this is often a soldering fault on the PCB. If you have an ohm-meter, make sure that pin 14 of the ATmega (Digital 8) has good continuity with pin 9 of the ENC28J60 - AND that it is not shorted to 0V, +5V, +3V3 or any other nearby signal which would prevent it from switching cleanly between levels. Dig 8 comes very close to the 3V3 connector on the "Wireless" connector - an easy place to get a solder short. Assuming that the ENC28J60 initialises correctly, it will flash the yellow and green LEDs on the ethernet connector - simultaneously 3 times at about one second intervals. This confirms that the ENC28J60 has been initialised. The code then performs a DHCP discover - sending a DHCP request to the router. If this DHCP request is answered, it then populates the various IP arrays for myIP, gwIP, DNS_IP etc and prints them out to the serial terminal as follows. You have now completed the testing phase of the Nanode and can move onto some real applications. Rename Ethershield_webserver.pde to EtherShield_webserver.pde then re-start IDE. Now from the Files/EtherShield/Examples load the EtherShield_webserver sketch. And your Nanode should serve its first webpage. It doesn't do much, but does have a clickable link to Andy Lindsay's blog page. Now re-compile and upload and refresh your browser window - you should see the text changes you made in the code reflected in the served page. It's quite straight forward to add the analogue readings from sensors to the web page. We first have to read the ADC input, convert the resulting number to ASCII, and put that number into a string. Then we copy those strings into the buffer which makes up the tcp sending buffer. Github Gists are a good way of sharing small code projects with others. Just google Github Gist, where it opens a new form, paste in your code and it gives you a Gist number. Then share the URL of that Gist with your group. To get the EtherShield examples to work you will have to edit the enc28j60 init function to read. In the analogue webserver example in the Gist this can be found on line 93. Most of the power consumed on the Nanode is in the line drivers of the ENC28J60 ethernet controller - even if it is transmitting or not! Here's someone's notes about putting the ENC28J60 into sleep mode so it doesn't use so much power. User softhook - Christian Nold has tried this and reports that it works well. If you don't have an FTDI cable and don't want to use the USB programming method, it's possible to use a standard Arduino as an FTDI cable (because it has an FTDI serial chip on it). Look for a green or blue-coloured circuit board with a USB connector at one end and 6 pins at the other end. There are cheaper cables available than the FTDI. Many generic serial cables use the Prolific PL2303 chip, but these usually have RS232 converters and a 9-pin D-type connector. However, some mobile phone programming cables have the PL2303 with TTL (or, possibly, 3v3) connections. These are available for as little as 3 Euro on Dealextreme or eBay. Artag bought a different CA-42 cable and found it had a moulded plug rather than the clipped one that Zoobab got. This makes it harder to open up and access the extra pins (though they are there if you strip the plastic away), so try to find out which sort they're selling before you buy. Here's some ideas to get you started with your Nanode. Feel free to add your favourite applications to this section. Wherever possible provide a link to relevant external information, code examples or a link to a GitHub Gist which can be quickly cut and pasted into a new code sketch. Nanode is very similar to the Arduino - in fact anything that you can do on an Arduino can be done, almost without modification, on the Nanode. The Nanode provides the familiar Arduino shield connectors - so you can plug a wide range of shield and protoboards straight into the top of the Nanode. With a shield in place, Nanode provides a second row of connectors on each long edge of the PCB - these connectors have been tailored to suit the needs of a variety of hardware devices. Nanode can be fitted with a row of connector pins on the top edge of the pcb, so that it can be plugged into a standard breadboard. Unlike the Arduino, all of the available I/O, both analogue and digital and power can be accessed from this single in line (SIL) connector - making connection to a breadboard simple, quick and easy. Nanode comes with a version of the LED Blink program already loaded into the ATmega328 microcontroller, done along with the bootloader. When you power up your Nanode for the first time - if all is well, the red LED will begin flashing. The LED is driven by digital pin 6 - whereas on the Arduino it is pin 13. Another difference is that the sense of the LED is inverted, you need to make the digital output pin LOW in order to bring the LED on. These changes are because the way in which Nanode handles its local serial port - and this will be explained in a later section. The LED was moved from 13, because pin 13 is in almost constant use by the SPI bus which talks to the ethernet controller. An RGB LED is a cheap and effective way of signalling changing environmental measurements or "moods". By fading the individual LEDs you can create a very large range of subtle colours. Using simple ramping up and down of Blue Green and Red will produce a display that could indicate temperture or power consumption starting at blue, fading through green and then through orange into red. Remember to use a current limiting resistor of at least 100 ohms in series with each LED. A ping pong ball or other semi-opaque plastic globe forms an attractive mood light. Cheap LED lamps available from Homebase for £2.50 each in a number of novelty shapes - globe, cube, heart and star. Use the servo/display connector adjacent to the 5V regulator. Plug the 3 wire servo cable directly into the end three pins of the connector - noting that the red +ve supply to the servo goes on the left. Use the servo/display connector adjacent to the 5V regulator. Plug the 3 wire display cable directly into the end three pins of the connector - noting that the red +ve supply to the servo goes on the left. Use the software serial library on digital 4 to send serial text and commands to the display. Nanode uses digital 8,11,12 and 13 to control the ENC28J60 ethernet controller. Nanode uses digitals 7,9,10 to a certain extent depending on what hardware options have been fitted. Note that Digital 2 is used for the interrupt input from the wireless module - if fitted. Please use Digital 3 for Onewire to avoid any signal conflict. Thermistors are a low cost temperature sensor available in a wide range of shapes and sizes to suit your application. For example if you wish to monitor your heating system, you might use the clip on pipe sensors from Rapid Electronics. Thermistors are generally built into a potential divider circuit using a resistor of similar value to that of the thermistor - eg 10K for a thermistor which has a resistance of 10K at 25 degrees C. The thermistor should be put in the upper arm of the potential divider so when the temperature rises, its resistance drops and so the voltage at the mid-point of the divider rises. For some applications, several Nanodes need to be connected together as a distributed monitoring and control network and be controlled by a master device, possibly connected to the internet. The Nanode Local Serial Bus was devised as an economical way of doing this, without having the cost and complexity of the ethernet controller and mag-jack on every board. The local bus can use inexpensive 4 core telephone cable to distribute power and communications between each board in the network. A power supply voltage of 12V is recommended. Each board takes its power from the bus, which can be up to 500mA maximum for standard 26 gauge telephone wire. This means that slave boards can power small electromechanical devices such as relays, motors, servos and solenoids using the bus power. Communications over the bus is done using 5V signal levels and from testing we found that 9600 baud worked well at distances of up to 300m of cable. The allocated Master device has ultimate control over the bus, and sends out packets of serial data to which the slaves respond, possibly returning their data to the Master. For this to work - we need a system of bus arbitration, such that there is only one device talking on the bus at any time. In the Nanode, this bus control is done using a pair of tristate buffers, which are left over from the four in the 74HC125 device - where only two were used for the ethernet controller glue logic. Let us assume that all slaves are listening to the bus - in otherwords their Rx pin is electrically connected to the Transmit line of the Master device via the bus. The master will address a slave by sending a packet of data which contains the (destination) address of that node. When a slave sees its own address come up, it decodes the packet of data, which is usually a command allowing the slave to access the bus, and transmit its data back to the master. To do this, the slave must enable its Transmit tristate buffer by lowering digital 6. This allows the slave to send data to the bus, where the master, will receive it. By lowering pin 6, the Red LED will also be turned on, and this gives a visual indication that that slave has been selected and that it is accessing the bus. This is the reason that the LED is on pin 6. The slave sends its data to the master and then releases the bus - by raising pin 6 and the LED will turn off. For a very similar project of a wired serial bus which uses the RS485 physical layer see Rob Gray's project. Busnet Project. This will be relevant if the Nanode is to be used as a DMX lighting controller. This code is derived from Dave's example and an arduino playground example shows a live sensor reading from Analogue 0 on the webpage upon page refresh. The trick to getting this to work was to use dtostrf() instead of sprintf() for the float to string conversion. So far In the above screen shot we are reaching the nanode on the local network directly with its IP address. However, the purpose of this project was to have a remote sensor that you could get to from anywhere. In this case you need to do some basic port forwarding from your external IP (that of your router usually) and the internal IP of the nanode on your local network. If you aren't familiar with "port forwarding" it is best to google or wiki it, whilst the basic principle is the same, the exact procedure depends on your router. Find your External IP by googling "my IP address"
Keep in mind that if your external IP Changes or your router assigns a new IP to the Nanode (as happens with DHCP), you won't be able to reach it. That is why it is best to set up a static IP in both cases if you intend on having a more permanent set up. If you don't have a static external IP, you can use a dynamic DNS service such as DynDns.com or No-IP to get a fixed hostname (e.g. myhome.dyndns.com) that always redirects to your external IP address. The template for the USB boot loader is USBaspLoader. It needs to be built using these config files. There are some caveats. Read the notes. The Nanode has a surface-mount chip soldered to the underside of the board containing a unique MAC address. Once you have successfully read your MAC address, you can enter it next to your Nanode serial number in The Complete List. If you did not have your tiny MAC chip soldered to the back of the pcb during the Nanode Weekend - this can be done at a later date at the space. Ken is next available to do this at London Hackspace on evening of 14th June. You will need a time machine set to this date in 2011. Wireless connectivity can be added to the Nanode using the Jeelabs RFM12B wireless board. Schematic can be viewed here. No need to solder in the 3.3V regulator or capacitors the board will gets its 3.3V power from the Nanode. For compatibility with the emonTx from OpenEnegyMonitor.org ensure the 433Mhz RFM12B module is used (this frequency can be used worldwide). JeeLabs use 868Mhz which can only be used in Europe. RFM12B modules can be bought in the UK from RS, Rapid or Farnell. JeeLabs RFM12B wireless breakout board. For connecting to the nanode there is no need to solder in the 3.3V voltage regulator or the capacitors. The RFM12B will get is 3.3V power from the Nanode's 3.3V voltage regulator. The INT/IRQ signal from the RFM12B socket is mistakenly OR'ed with the INT from the ENC28J60 Ethernet Chip before going into the 74125 Tri-state buffer which acts as a 3.3-5V level converter. If the ENC28J60 sets its interrupt line high, then the low going RFM12 interrupts will be pulled up by this high signal so they might only get down to 1.5V which is too high to register as a logic 0. The 10K resistor R13 also pulls the INT line high. This stops the RFM12B working at the same time as the ENC28J60. The solution is to lift pin 4 of the ENC28J60 out of its socket and not solder in/remove R13 (the 10K resistor, one resistor down from the 1 ohm ferrite). This disconnects the ENC28J60's INT line (which is not used) from the circuit and removes the resistor which was pulling the line high. No additional wire link is needed as first though. Bitlash is a interpreted command shell (language) which runs on the Arduino. It takes 14K of program memory, but allows programs to be written from a serial terminal and stored as functions in the EEprom on the ATmega328. It is reminiscent of the early 1980s home computers which executed BASIC directly from power-up. Bitlash could be used to write simple scripts to automate sensing functions, datalogging or other applications running on Nanode. There is an opportunity to be able to reprogram a Nanode remotely, and have it perfor different tasks. Bitlash can incorporate any of the Arduino library functions, making it simple to combine Bitlash with existing C-code. On the underside of the Nanode 5 pcb is a footprint to accept a SPI memory deviice. This can be EEprom, data flash, SRAM or FRAM (ferroelectric memory). I have done some test code for the very cheap (£1.20) 23K256 spi SRAM which is a 32K byte device. If you intend to run the SPI SRAM, you will need to modify the way the board is powered - so that everything runs off 3.3V. See below for details. Nanode 5 uses both 5V and 3V3 to run the on-board devices. This has been done mainly as a convenience so that it is compatible with Arduino and Arduino shields which generally use 5V. However, there are an increasing amount of low power devices which only need 3V3, such as the on board ENC28J60 ethernet controller and the spi memory device on the underside of the pcb - so advanced users may wish to modify their boards to run solely on 3V3 - particularly if they are to access the spi SRAM. First you have to identify where 5V is produced or enters the pcb. Either the red wire of the FTDI cable, the USB jack or the 5V 7805 regulator. Having identified these sources you need to isolate them or in the case of the regulator modify so that they produce 3V3. One way would be to remove the existing 5V 7805 regulator and replace it with a 3V3 regulator, and then cut the pin on the FTDI connector that feeds 5V to the pcb and wire a link from this severed pin to the new input of the newly added 3V3 regulator. For completeness you would also need to cut the 5V input track that comes from the USB socket. Once you are feeding the 5V into the new 3V3 regulator, you need to connect this 3V3 to the existing 5V rail. The easiest way is a wire link which connects pins 2 and 3 of the Arduino shield "power" connector. A pictorial guide to this modification will be provided later. RESTduino provides a way to directly control the Nanode hardware from a client - server session. The commands that you want to run on the Nanode are encoded into the URL. For example turn I/O pins on and off or read an analogue temperature sensor. We hope to combine RESTduino with the bitlash command interpreter to make an interactive way of running scripts on Nanode and editing them remotely. Here's what Andy Lindsay says about RESTduino and how to run it on your Nanode. This version of RESTduino is for ENC28J60 based ethernet shields only, not the Official Arduino Ethernet Shield, these use the wizznet chips, it is very heavily based on the original RESTduino by Jason Gullickson, full details at: http://jasongullickson.posterous.com/restduino-arduino-hacking-for-the-rest-of-us. Full thanks and credit go to Jason for the original code and ideas. I have taken his work and massaged it into an application that works with the ENC28J60 based ethernet shields. I've also updated the demo to use 3 sliders to change the colours on a RGB LED. RESTduino is a simple sketch to provide a REST-like interface to the Arduino via the Ethernet Shield. The idea is to allow developers familiar with interacting with REST services with a way to control physical devices using the Arduino (without having to write any Arduino code). Later versions of the sketch may provide additional functionality (servo control, etc.) however if you need more than just basic pin control you're probably better off learning the basics of programming the Arduino and offloading some of your processing to the board itself. Or you could use the Nanode, http://nanode.eu which combines both the Arduino functionality and the EtherShield on one board. If you use a Nanode then you will additionally need the FTDI programming lead. For testing you'll want some hardware to connect to the Arduino, the demo uses a common cathode RGB LED connected to pins 3, 5 and 6. Connecting single LEDs between the pins and ground will also work. The next line you'll need to modify is this one which sets the IP address; set it to something valid for your network. Now you should be ready to upload the code to your Arduino. Once the upload is complete you can open the "Serial Monitor" to get some debug info from the sketch. Now you're ready to start talking REST to your Arduino/Nanode! This will use PWM to illuminate the LED at around 50% brightness (valid PWM values are 0-255). A simple example of how to interface with RESTduino via jQuery is included as DemoApp2.html. This page displays 3 slider controls (via jQuery UI) which when adjusted will set the PWM value of Pin #3, #5 and #6 to the value selected by the slider. These then change the appropriate colour on the RGB LED. If you look at line 32 you can see where the REST URL (you'll need to adjust this for the IP address of your device) is constructed based on the selected value of the slider and on lines 53, 63 and 73 an AJAX request is executed passing the URL constructed above to the Arduino. Bitlash is a simple interpreted script language which runs on Nanode or Arduino. It allows you to define new functions, store them to EEprom memory and to control the I/O port pins with a few simple commands typed over the serial port. It's a little reminiscent of the late 70's early 80's home-computers that from power-up ran an interpreted basic. It's better than Basic because it ties in with the Arduino libraries and function calls, and you can mix your C code with Bitlash running in the background - it just seems such a cool idea as an interface to a simple microcontroller. Bitlash has a Telnet example, so that you can Telnet into it remotely and edit scripts to control different things. Well you could - if our TCP/IP stack supported a Telnet Client. Unfortunately it doesn't, so we have to find another way of getting our command line data up to the Nanode. One neat way of doing this is to embed the command line at the end of the URL you send to your Nanode server, and then persuade the Nanode to send you something useful back. http://192.168.0.105/password/page_one and it would serve the page. If however you don't spell password correctly, the device will return with a 404 error - page not found. This simple mechanisms allows very crude password control over what is served - important if you don't want everyone tinkering with your Nanodes. I've been looking at the RESTduino example - and it is quite simple to see how the code parses through the URL looking for backslashes and stripping out the parameters contained between them. The command buffer is set to 50 characters - but I am sure we could extend this to get a good line length - say 127 chars. So a merge between REST and bitlash would just have to have the REST command line buffer deposited into the bitlash command line buffer (make them one and the same) and bitlash will execute the commands included in the URL. There is then another string buffer called the Client line - and this is used to send text back to the client. Again bitlash would populate this with the output response from the executed command and send it back. Bitlash parses and executes this command and prints 4 back into the Client's Line, followed by a newline and its > prompt. To make this nice and elegant we would just need a bit of processing code or Python, which accepts lines of text commands and precedes them with the http://192.168.0.105/bl/ header. uIP is an alternative TCP/IP stack written for resource limited micro-controllers. Guenther Hoelzl has combined uIP plus the ENC28J60 library from Guido Socher, to make an IPV6 implementation - which will run on any Arduino like device with ENC28J60 ethernet controller - including Nanode of course. 1st August - Stephen Early @sde1000 reports that he has successfully ported uIP to his Nanode and it responds to pings and DHCP now working! - Good work Stephen - we look forward to further developments along these lines. It uses less programme memory and RAM than uIP/Contiki. The Jee Labs EtherCard Library works on Nanode with no modifications whatsoever. It even uses pin 8 for SPI chip select. Examples and details on maniacbug's blog. Tuxgraphics were the first company to produce a board based on the combination of the ATmega and the ENC28J60. In fact, most of the library was written originally by Guido Socher and Pascal Stang working for Tuxgraphics. Whilst the original library has been updated and modified by others, much of the basic ENC28J60 low level driver code has remained and is common across any device using the ENC28J60. The Tuxgraphics web server is not a normal web server. It is an IO-web server. It reads sensor values or IO-pins and it controls digital output lines or relays. It is as well possible to have analog output lines providing arbitary voltages between 0V and 3.3V by using a R2R-ladder DAC. Sometimes you want to have more digital output pins than the microcontroller you are using provides. You can either switch to a bigger microcontroller chip or use a 74hc595 port expander. This article focuses on the 74hc595. Using multiple 74hc595 chips you could in theory have an infinite amount of output lines on a single ethernet board. The advantage of the 74hc595 is that you save on wires if you want to have the 8 additional output pins in a different place. There is a serial connection between microcontroller and 74hc595. The cable length of that connection should however not be more than a metre (3ft). The 74hc595 chips can be chained to provide 16 bit output ports or more without occupying any further output lines on the atmage. For another article on IO-web servers which provide digital and analog input lines together with digital output lines see "Using the tuxgraphics embedded web server to control scientific equipment". Based on Victor Aprea wickeddevice code to send Nanode's data to Pachube, here is a tutorial to send thermistor's temperature to pachube: Nanode and Pachube for the rest of us. Nanode is great for streaming internet radio using a VS1053 MP3 decoder and the uIP TCP/IP stack. Here's another take on a web server for Nanode, allowing control and monitoring of a Nanode with a mobile-optimized interface. See all the details at Control and Monitor Arduino Over the Web Using ENC28J60. Found it necessary to cool the 7805 when the device is fed by a 7.5V DC wallwart. A simple heatsink does the trick - and by sheer co-incidence it can be folded over the elco's. This page was last modified on 25 July 2016, at 18:07.